Are the Spider Solitaire games free to play? There's no better answer to that question than that the website and all the games are 100% free to use and will continue to be so. Nor do you need to log in or create an account to use the website. 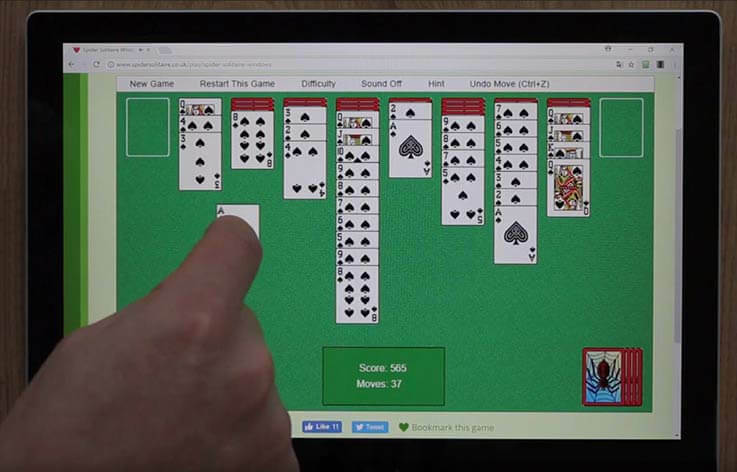 If you've never played Spider Solitaire before, it may look a bit complicated at first sight. Read the rules we have put together and have a quick look at the helpful video, and you'll soon get the hang of it. We recommend that you start at the beginners level. Once you've mastered this, then you can have a go at one of the harder levels, for instance 2 suits. Will Spider Solitaire work on my tablet? In the past, you could only play these types of games on a laptop or PC, but now you can play them on every conceivable type of device. Play on your tablet while you're relaxing on the sofa or on the train on the way to work, or on your mobile phone. If the game does not work properly on your device or browser, send us a quick message then we can fix the problem. How do you create the games? We have developed the vast majority of them ourselves and we have also got games developed by partners. Got a great idea or do you develop games yourself? Let us know, we are always looking for new ideas. Do I need to download your Spider Solitaire games or can I play them online? You can play all the games on our website there and then in your favourite browser. It doesn't matter if you've got an iPad with Safari or a laptop with Google Chrome, you don't need to download anything. The games run on our own server and they load from here. There are a few things you can try if you can't get a game to work. If you are playing on a device with a keyboard, we recommend pressing the F5 button (CMD-R on a Mac). The page should refresh and everything should work again. If not, try clearing your browser's cache. Check how to do this on Google since each browser is slightly different. Still got a problem? Send us a message and we'll get to the bottom of it!